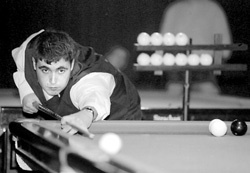 This article is not, of course, about the new style Russian film that has made quite a stir but about Russian billiards, the championship of which has recently ended with the triumph of Yaroslav Vynokur. The Odesa native, bent in the past few years only on taking the highest-purity medals, has remained loyal to himself this time also. Without any apparent effort, he won the Ukrainian champion’s gold medal in a game against Yuri Tarasiuk from Rivne, who had never before played at such a high level. It became clear at the very beginning of the final game who would win. Outwardly calm and phlegmatic, Yaroslav kept the strings of game with his hands, only occasionally yielding to his opponent. He played firmly and accurately, allowing himself the least possible errors permissible in such games. Yuri’s play made an ambiguous impression on the sophisticated audience, among which there also was former Kyiv Dynamo halfback Ivan Yaremchuk: sometimes he made impossible balls in very complex positions or he managed not to scratch even when there was in fact no other way for the ball. However, the player’s huge potential, despite the crushing defeat 2:5, suggests successful future performance. Of late, much to the tremendous joy of billiards devotees, the federation of this sport has offered them a tight schedule of competitions. Audiences look forward to new tournaments, leaving the brilliant and gripping finals of the championship of Ukraine in Amerykanka (American billiards) to go down in history.